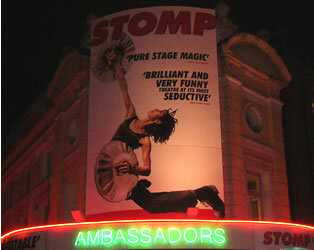 Guide to the show "Stomp"
This page is a brief guide to the show Stomp, which is currently this is being staged at the Ambassadors Theatre in London's West End. Eight performers create interesting sounds and rhythms using everyday items such as brooms, newspapers, matchboxes, bags, rubbish bins and their own bodies. Each one has his/her own unique character, and the interactions between the group members and with the audience adds a comic touch. 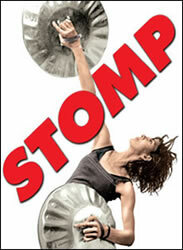 Stomp was originally created in Brighton in 1991 by Luke Cresswell and Steve McNicholas. It has since been performed around the world. The show opened in the West End in September 2002 at the Vaudeville Theatre, before transferring to the Ambassadors in September 2007. The performance lasts about 1 hour 45 minutes. Note that there is no interval.